Varen got to meet some of the friends last night. So far he's only really met Loulou, since I live with her, and Jarred of Hurlingham very briefly when he sneakily visited J at work to deliver my Christmas present. 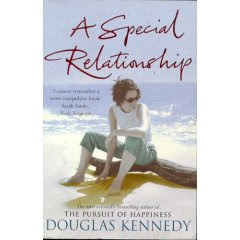 So, back on the weekend, before the hectic week took over, I finished reading Douglas Kennedy's A Special Relationship. Sally Goodchild, a thirty-seven-year-old American journalist, suddenly finds herself pregnant and married to an English foreign correspondent, Tony Hobbs, whom she met while they were both on assignment in Cairo. From the outset Sally's relationship with both Tony and London is an uneasy one - as she finds her husband and his city to be far more foreign than imagined. But her problems soon turn to nightmares when she discovers that everything can be taken down and used against you. I quite enjoyed it. It is one of two Douglas Kennedy books we have at Book Club which initially I avoided since they appeared "way to girlie" from me ... Eventually, I decided to throw caution to the wind and give his The Pursuit of Happiness a read. Manhattan, Thanksgiving Eve 1945. War is over and Eric Smythe's party is swinging. Everyone is there, including his sister Sara. Then in walks the gatecrasher - Jack Malone, an army journalist fresh from a defeated Germany. This chance meeting between Sara and Jack will have profound consequences. I actually thought those were self-hep books when I first saw the covers. And I am equally prone to doing it ... especially with books! Why can I find so many interesting books I want to read in Exclusive Books but nothing in the boring library?